Here are the results of “Best Black Tea – A Nepalese Food Quiz” posted a couple of weeks ago. Check out the answers along with a few tidbits about my experiences and then the winners will be revealed. 1. 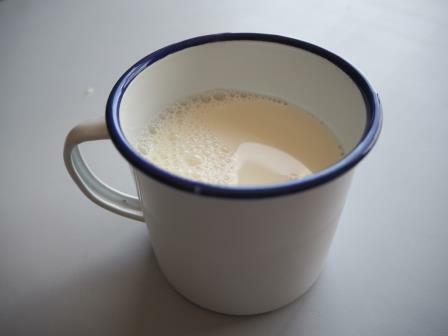 Tato Dudh – Hot Milk (or as one of our Sherpas called it, Hot Millick). Powdered milk never tasted so good. Offered at breakfast (into which one could mix instant coffee powder – shudder – or hot chocolate powder – that’s more like it) and also after dinner for that last warming drink before beddy-byes. 2. 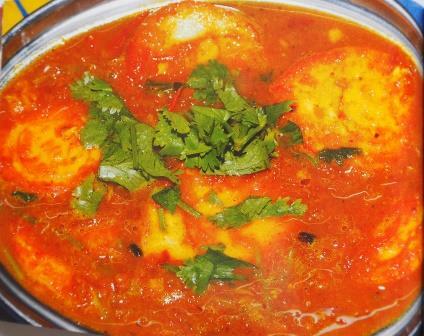 Anda Tarkari – Egg Curry. Admittedly, probably my least favourite of all the curries we were offered but still highly edible. 3. 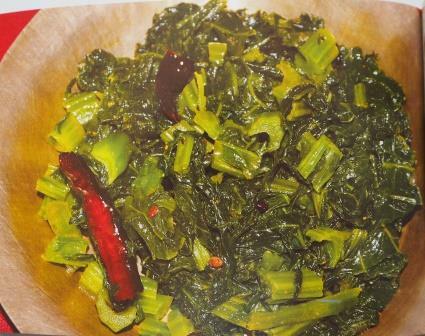 Saag – Spinach. But like no spinach you’ve ever tasted. Usually plucked fresh from one of the village gardens, I could eat this by the plateful (and occasionally needed to as my inherent low iron levels struggled with the lack of red meat on offer). 4. 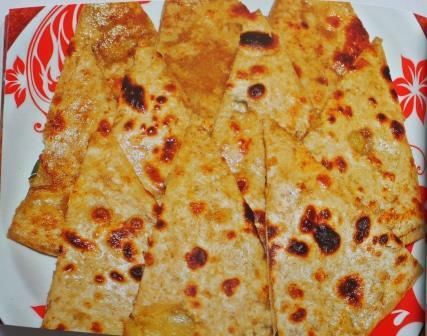 Alu Paratha – Flat bread stuffed with potato. One member of the group reckoned this tasted just like her Irish grandmother’s potato bread. I guess some food is universal. 5. 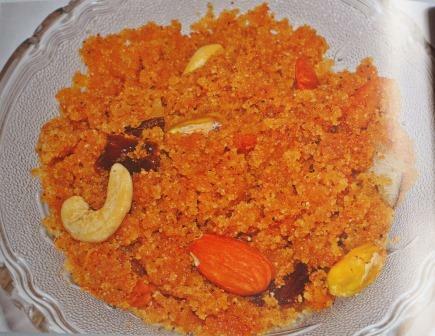 Suji Ko Haluwa – Semolina Pudding. We were constantly spoilt with dessert after our evening meals – pineapple slices, chocolate pudding, apple pie – but the semolina pudding was the most Nepalese offering. One member of the group couldn’t bring herself to eat it as she was force-fed semolina pudding at boarding school as a child. Food has memories. 6. 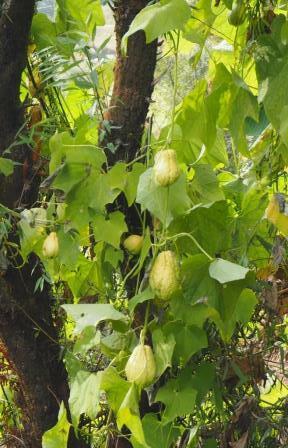 Chayote – Spiky Gourd. Our meals were a vegetarian’s delight (luckily for the one vegetarian in our group) with a multitude of different vegetables, most of them familiar but with the occasional new introduction. Chayote tastes a bit like zucchini (courgette). 7. Dal Bhat – Lentil Soup with Rice. 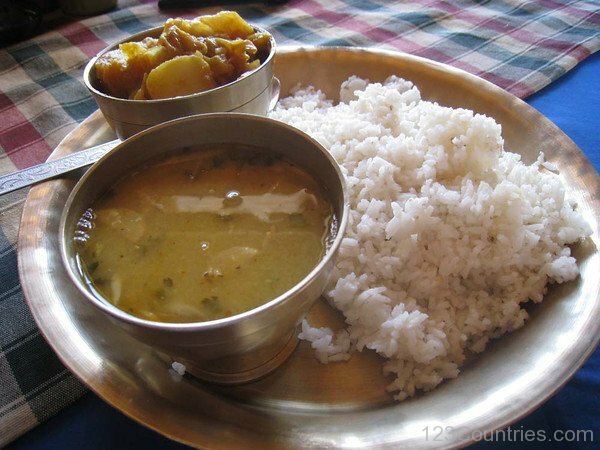 This is Nepal’s national dish and is eaten in copious quantities. My absolute favourite dish of the trip. For our meals, the dal was poured onto the rice. 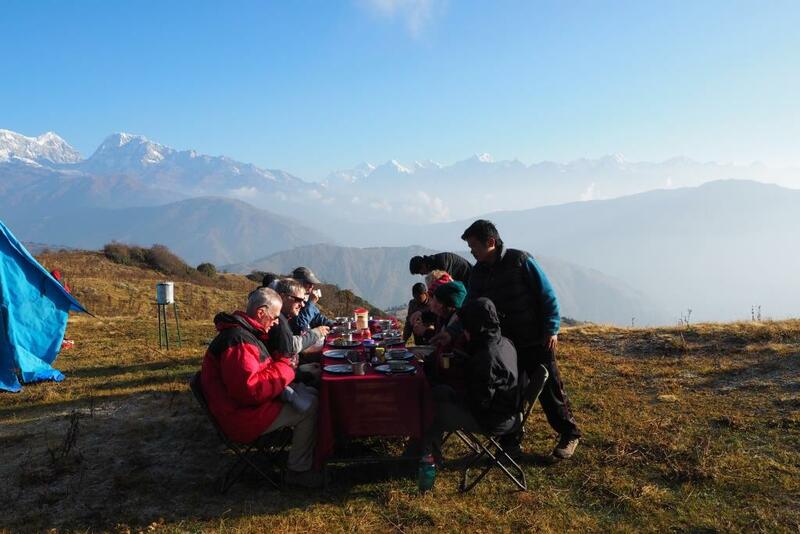 One member of the group got most distressed when one of the Sherpas put some vegetable curry on top of her rice so there was no room for the dal. One must eat dal bhat as it is meant to be eaten. 8. 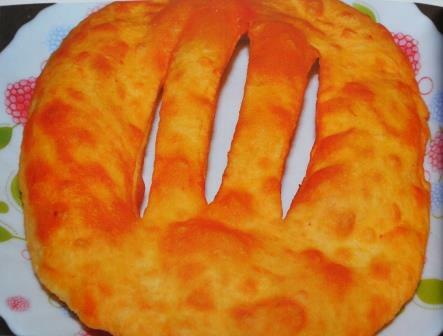 Phini Roti – Fried Roti (also known as Tibetan Bread). We ate many different versions of bread but I think this would be my favourite. It is soft and slightly chewy with a hint of sweetness. 9. 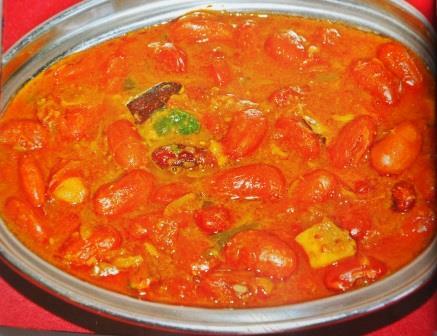 Rajma Tarkari – Kidney Bean Curry. Probably my favourite curry, this was absolutely delicious. And yes, we all know what happens when you eat a lot of beans but we were all in it together. Sharing is caring. 10. 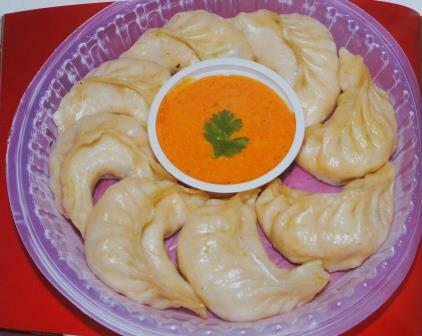 Momo – Dumpling. We were always served vegetable momos but they can also contain chicken. The first night these were offered, I was not feeling well and so was able to eat only one. I had to wait more than a week for them to reappear on the menu. (I was beginning to despair that they would not reappear at all.) I ate six. 15 Points to Lynn at Life After 50 for being the first to provide all correct answers. However, she loses 5 points for not answering in numeric-alpha format (Rule #1). “But you said nothing would happen if we broke the rules!” Yeah. I lied. Don’t upset my system. 10 Points each to Joanne at My Life Lived Full, Cynthia at littleoldladywho.net and Sue at Travel Tales of Life who all managed to correctly identify every food item in the correct format. 5 Points to Bun at Bun Karyudo for providing answers to every item and getting two correct. 5 Points to Barbara at Barbara Pyett for her very creative answers. However, she loses 2 points for listing Dal Bhat as her least favourite. 1 Point each to all those who had a crack at identifying at least one dish and also to all those who commented at all because you know I love to hear from you even if you don’t want to play. Congratulations to the winners. As soon as we’re all located in the same city, I will present you with your very large, very shiny trophies at an elaborate awards ceremony. Now, I must leave you all to go and make suji ko haluwa for a family dinner this evening.